An ongoing project to revamp the interchange of Florida’s Turnpike and Interstate 4 will result in renewed offramp closures for drivers trying to get to I-4 from Florida’s Turnpike, according to a news release from the Florida Department of Transportation. The roadway closures are similar to those instituted from April 27 through May 2. Only drivers trying to exit the turnpike at I-4 are affected, as are truckers who wish to use the tandem parking lot that is in the middle of the interchange. The ramp closures do not affect drivers who want to get onto the Turnpike. The ramps from Exit 259 in Orlando are closed only during the overnight hours, and the closures affect both northbound and southbound travelers exiting Florida’s Turnpike, according to the latest FDOT release. Christina Deason, spokesman for the FDOT, said, “All exiting traffic [will be] detoured to Exit 255, Consulate Drive, for SunPass customers or Exit 254, Orlando South/US 17 92/441, for cash customers.” Cash customers will be detoured along the westbound leg of the Beachline Expressway, State Road 528, in order to reach I-4, she said. The trucker lot that was affected in April will be impacted once more. Click to get full list of detours in a PDF. Single trailers will be permitted on the lot during the closure hours, Deason said, but the access to the turnpike from the lot will be intermittently impacted between 1 a.m. and 5 a.m. 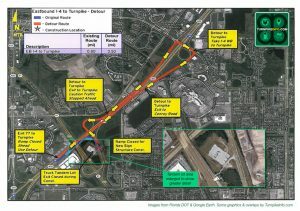 Images of the detours were provided by the FDOT and may be viewed in portable document format.